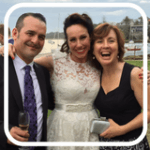 I’m Angela Finn, Sydney Marriage Celebrant. 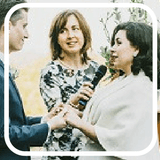 I create wedding ceremonies that are meaningful, fun and enjoyable. For me, wedding ceremonies are about the moments and the raw emotions. Real connections. Moments felt and shared. It's celebrating your love and that of your family and friends. Equally importantly, it’s about making sure that you and your guests are relaxed, and enjoy your day. So, if you would like a natural and engaging style of wedding ceremony, that's a highlight of your wedding day, I would love to hear from you. 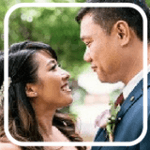 Whether it's your first, second or third marriage; or whether your theme is traditional, quirky or contemporary, I will provide you with a wedding ceremony to suit your style and personality. There'll be no awkward moments, no weird jokes, no corny stuff or surprises. Instead, your wedding ceremony will celebrate your love story and commitment in a way that's true to you. After all, you're not a cookie-cutter couple, so there's no need to have a cookie-cutter wedding. I'd love to personalise your wedding ceremony - so get in touch, and we can have a chat! Angela played a big role in making our wedding day perfect. She is attentive and genuine. She spent time to get to know us and that definitely showed during our ceremony. Angela was also fun, relaxed, supportive and offered plenty of helpful ideas on how to make our day special. "Angela, thank you so much for your help. We have had so much glowing feedback about you, particularly from family who thought you were so good. It was so nice that you took the time to say hi to the mums, dads, aunty's & uncles – which they really appreciated. I am not a good public speaker, but your calming presence helped me through the ceremony. You are a wonderful person." "From the moment we met Angela, she seemed like an old friend and we were delighted that we shared similar values. She is a warm, intelligent, genuinely kind person with a wonderful sense of humour and a truly generous spirit. She helped us to write a ceremony that represented us as a couple. We are so happy that Angela married us. We could not have had such a beautiful wedding without her." " When we saw Angela marry friends of ours, we knew that she was the perfect fit for us. She has such a wonderful, warm and friendly energy and we really felt a great connection with her. Our ceremony was personal and she made such an effort to share our story in a way that was Michael and I to a tee! I am absolutely thrilled Angela married us and would highly recommend her." Angela was absolutely amazing. She met with us several times before the day to get to know us. This was incredibly important to us and made the day more special. Her energy and huge smile are infectious. She brought so much joy to our wedding. A true professional with a personal touch. We both so greatly appreciate Angela’s contribution to our wedding. It was a pleasure working with her to create a ceremony that incorporated Australian-Cuban-Persian traditions and culture. No matter the challenges we threw her way, she managed the entire process with ease. The energy and enthusiasm she brought to all she did made the wedding experience enjoyable. Angela is lovely, professional and highly organised. We always looked forward to our meetings with her, because her enthusiasm and warm smile is so contagious and reassuring. She created a relaxed atmosphere before and during the ceremony and thanks to her, our wedding day was perfect. From our first meeting, Angela “got” us, understood what we wanted, and helped us shape those areas we weren’t sure about. This created a special ceremony that was a true expression of who we are for each other and our families. 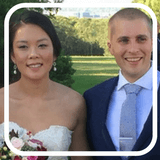 Her empathy, gentle humour, and joie-de-vivre helped create a wonderful wedding ceremony. Highly recommended. My wedding celebrant packages are designed to be simple and all-inclusive, with a choice of options. 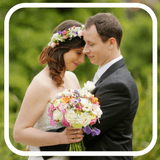 The entry wedding package starts at $795, which includes a simple ceremony at a location close to Panania. 1. A meaningful and enjoyable marriage ceremony. 2. All legal paperwork and lodgement of appropriate documentation with Births, Deaths & Marriages. 3. A professional, high quality portable Mipro PA system, including hand held wireless microphone. You can also play music through my PA.
4. A true industry professional, ready to impress. If you'd like a quote, contact me today.